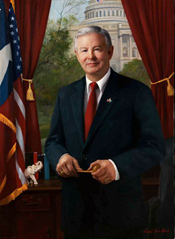 A small elephant figurine peeks from behind the American flag in this portrait of Energy and Commerce Committee Chairman Joe Barton. 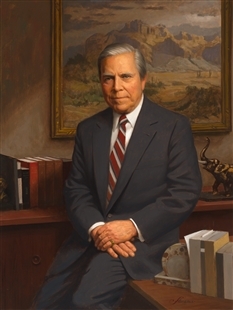 Beginning in the late 20th century, committee portraits increasingly used symbols of the subject’s affiliations and interests. Here, the elephant, symbol of the Republican Party, is joined by the Texas and American flags, the Chairman’s gavel, and the Capitol’s dome, to provide the viewer with a full sense of the subject’s role and responsibilities in the House.